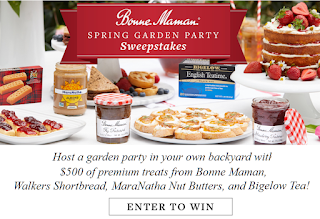 Bonne Maman Garden Party Food Prize Pack Giveaway - 5 Winners Win 6 Boxes of Walkers Shortbread products, 6 jars of MaraNatha products, 18 boxes of Bigelow Tea, 6 jars of Bonne Maman Preserves and Fruit Spreads. Limit One Entry, Ends 5/31/19. YUM!!! GOOD LUCK!